University Student Develops Phone App To Feed Nearly 600,000 Homeless People a Year — With Food That Otherwise Would be Wasted | "Global Possibilities"
Food waste is a massive problem in America. So is hunger. The National Institute of Health estimates that, as a nation, Americans waste 40 percent of the food we produce. Let that sink in for a moment. People are going hungry in the United States and yet we throw away nearly half of our food? According to a report released in 2015, around 60 million metric tons of food is wasted every year in the United States, with an approximate value of $162 billion. However, Jonathan Bloom, author of American Wasteland: How America Throws Away Nearly Half of Its Food (and What We Can Do About It), believes the number is much higher — more to the tune of $250 billion of annual food waste throughout the entire supply chain. Incredibly, an estimated 32 million metric tons of it ended up in municipal landfills, which costs local governments about $1.5 billion a year. And don’t forget about environmentally catastrophic methane emissions, a staggering 25 percent of which are due to food scraps in landfills. But the problem isn’t only in the United States. “A third of all the food produced in the world is never consumed, and the total cost of that food waste could be as high as $400 billion a year. 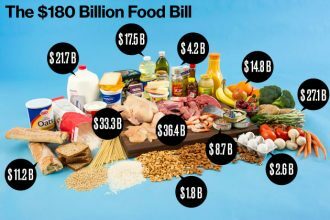 Reducing food waste from 20 to 50 percent globally could save $120 billion to $300 billion a year by 2030, the report found,” states the New York Times. Be that as it may, a small (but powerful) anti-waste revolution is taking place across the pond from the U.K. in Northern California, where a woman developed an ingenious app, which has helped to feed almost 600,000 people — entirely with food that would have been tossed away. Growing tired of America’s increasing food-waste problem, 25-year-old UC Berkeley student Komal Ahmad decided to take matters into her own hand. Four years ago, Ahmad was approached by a homeless man asking for money to buy food. Instead, she invited him to lunch. As they ate, she learned that he was a recently returned soldier from Iraq who had experienced a run of bad luck. Ahmad said the experience “blew my mind,” which inspired her to work with the university in setting up a program to donate any excess food from the school’s dining halls to local homeless shelters. She believes excess food-wastage “is literally the world’s dumbest problem. … Hunger is bad – it’s terrible everywhere – but in America, in the most prosperous, industrialized country in the world, this just shouldn’t exist,” Ahmad told New York’s Daily News. Tackling the problem with a technological twist, Ahmad came up with the idea for Feeding Forward, a mobile phone app that allows companies and event planners to donate extra food to the needy — with an easy click of the button. Through the app, donors tell Feeding Forward drivers where they’re located so the drivers can collect the food, which is then quickly taken to where it’s needed most. JoAnne Berkenkamp, of the Natural Resources Defense Council, believes on-demand apps like Feeding Forward are key in solving excess food distribution problems. Within a year of the app’s launch, over 575,000 people have been fed with about 690,000 pounds of food redistributed , which would have otherwise ended up in the landfill. Ahmad hopes to expand Feeding Forward to cities like Seattle and Boston in the future. For the time being, those who are hungry — or who would like to support the organization — can visit the Feeding Forward website. Other on-demand food recovery services include Munchery, Food Cowboy and LeftoverSwap.